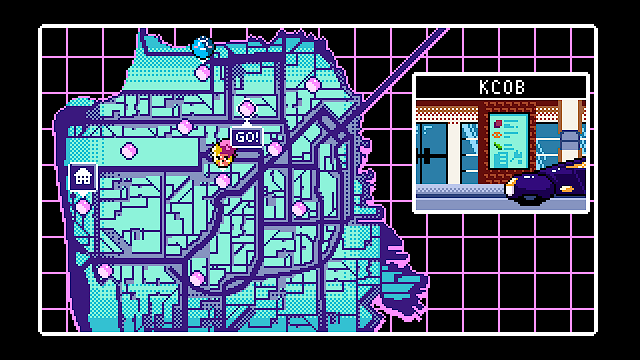 My first moments in 2064: ROM were brief: I went into “Options” to adjust settings, and the game promptly froze on me. My last moment in-game occurred when I reached the Epilogue and felt the urge to wet my whistle at the now familiar Stardust bar; and it promptly froze on me when I was served my drink. I don’t wish to dwell on the various minor glitches I encountered, as none of them were game-breaking; the developers have announced that a patch is coming very soon, so I hope most of these irritations will be cleared up. But I can’t deny that the technical hiccups left me with the impression of a game not as polished as one would hope for. 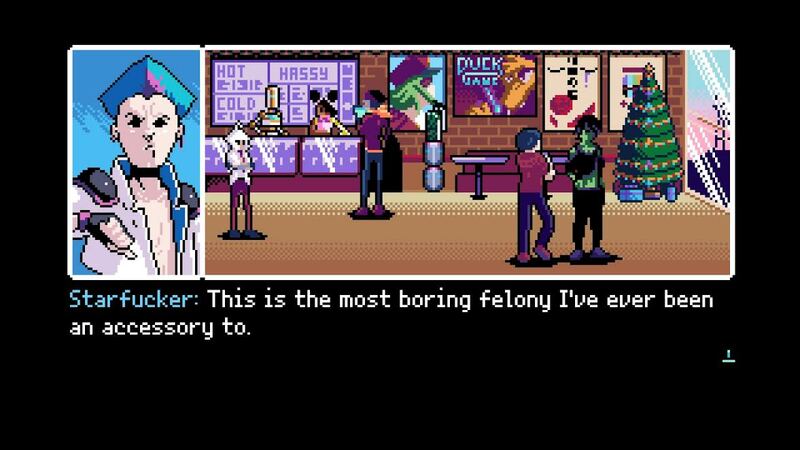 2064: ROM is a self-styled “cyberpunk adventure” game; it was released originally in 2015 (as Read Only Memories) for PC, and this game is the “deluxe” version featuring, among other enhancements, complete voice acting. It harks back with reverence to the PC point-and-click adventure games of the 1990s while also incorporating a strong visual novel aspect. So you could say that the genre is a traditional one but the story and themes clearly reflect our current preoccupations and concerns. Nearly 50 years into the future, in Neo-San Francisco, you - the invisible first-person player - awaken in your dishevelled apartment, complete with ‘ancient’ laptop, reflecting your struggle as a journalist to get newsworthy assignments in an age where large corporations have a stifling grip on every area of public interaction and information. This is a future world where people ‘jack into” VR networks, and gene technology has brought with it human cyber augmentations and implants as well as inter-species ‘hybrids’. And you wake up to be greeted by a rather cheeky ROM - a Relationship and Organizational Manager, one of millions of AI robot units that are crucial for running this world - who introduces him/her/themselves as Turing and requests your help, with great urgency, to track down his missing creator, Hayden Webber, an engineer at the mighty Parallax AI corporation. Clearly, Turing is not your average ROM. Thus starts your adventure in unravelling the mystery and ultimately being faced with decisions that will change society forever. Story is always paramount in a visual novel, so I really don’t want to give away much more than this. Before you can start your detective work, you need to answer two questions for your character creation: preference of pronoun (anything goes!) and choice of diet. 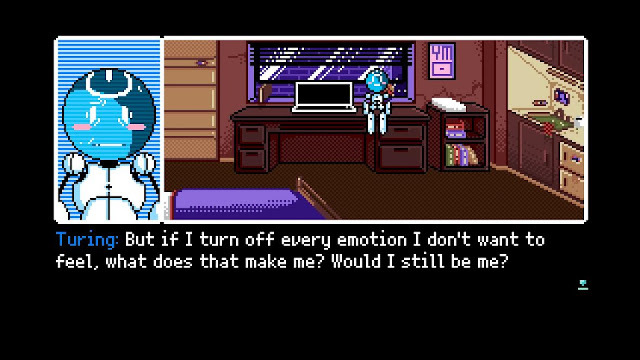 Much later in the game, in a touching moment of Turing contemplating his identity, the significance of the pronoun issue becomes apparent; but even then, the initial multiple pronoun choice still felt a bit gimmicky to me. Once you dive into the exploration side of the game, you’ll find it unfolds very much - almost disappointingly - like most adventure games: you need to work through a number of dialogue choices to advance. 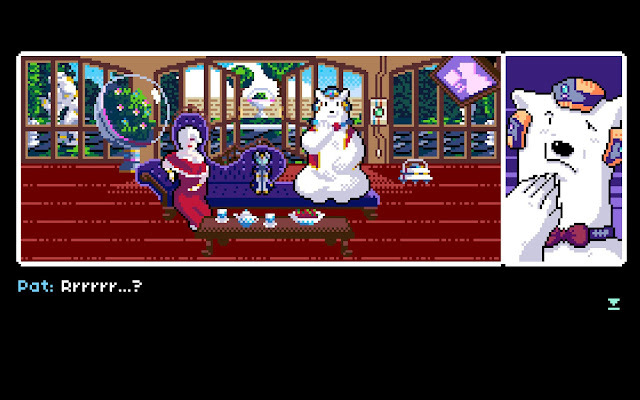 Sometimes, the dialogue gives you simply a greater depth of information; sometimes the choices you make are crucial for taking the story down one particular story arc and towards one of the six possible endings. This means that, inevitably, you will probably make choices not because of how you envisage your reporter character, but how you think that choice will carry the story forward to a particular ending. I know I did; the game ‘rewards’ non-violent reactions, and that course of action helped bring me to Ending One (the so-called “good” one). The issue I want to raise here is how an author’s choice of narrative point of view, coupled with gameplay mechanics, will influence how you perceive, and enjoy, the character you’re playing as. In this game, I did not form any close bond at all with my journalist character. He/she remained the typical first-person ‘anonymous’ cut-out for me. I could not form a direct visual bond because my character was never on-screen; my journalist was there as a gameplay device, delivering paths along which to travel. This means that the weight of getting close to characters lay on the shoulders of the rest of the cast, and of course in particular on Turing - who tends to be rather fussy and pedantic and looks like a very generic robot. And that’s where I struggled, certainly in the whole first half of the game. It was not until well into the second half that I became more invested in some of the dramatis personae. You have probably played a classic adventure game before - maybe Grim Fandango. 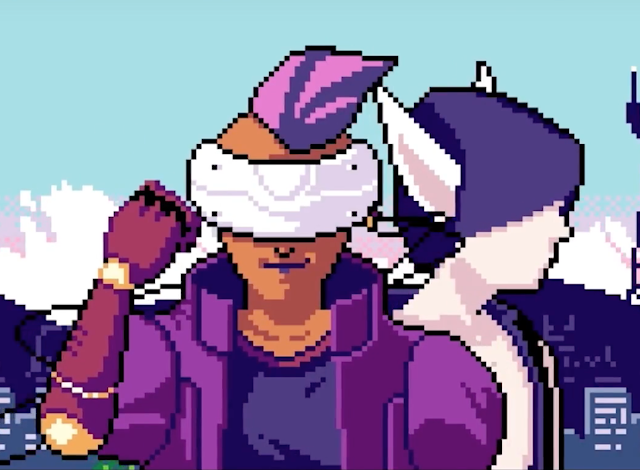 We experience the game in first-person - we’re literally inside Manny’s head - but on-screen we actually see and control Manny (as if third-person), so making dialogue decisions or doing physical tasks offers a level of deep involvement that, for me, was missing in 2064: ROM. To be fair, Grim Fandango’s combination of narrative and gameplay point of view is insanely tricky to pull off. I simply want to say that there are approaches beyond the tried-and-true, and I couldn’t shake the feeling that this game didn’t quite hit the right note in this regard. So, I felt a bit like the proverbial Police Constable Plod, diligently interviewing everyone on my list. Extracting information from people who were complete strangers to me proved a doddle; everybody freely offered up what I needed to know, including personal back story. This imparted a slightly artificial feel to the proceedings - I kept wishing someone would put up resistance or a really cunning subterfuge! I was grateful, however, for the very clear directions the game gives you; you never struggle figuring out where you need to go next, which keeps the flow of the game going nicely. Of all the people you meet and recruit to your cause throughout the game, there is one who exemplifies the issues with how the story is told: it’s Jess, the radical lawyer. She is a human-feline hybrid, and early on she is prompted to divulge her deeply harrowing personal story of why she became a hybrid. She spews out her story like an angry lava stream - screen after screen of text (with the voice acting of course). I was stunned by the revelation; but I also felt like a data dump had been deposited at my feet. This was not the only time when I strongly felt the urge to exclaim “Show, not Tell!”. By contrast there is one successful, completely delightful example of character portrayal through story development - the juvenile delinquent duo Chad & Oli. It’s not surprising that the voice actors clearly relished such well-written characters and brought them to life with gusto; whereas some of the other voice acting did not always come across as convincing, with actors on occasion running out of steam halfway through sentences. Several of the personal ‘data dumps’ at crucial moments contained disclosures that were in one sense satisfying, as they brought me closer to the character, but I distinctly felt that this technique was a bit too obviously trying to pluck my emotional violin strings. Coupled with the fact that the game is set just before Christmas, I’m inclined to describe it as a heart-warming tale. Then there are of course not so heart-warming aspects to the story. 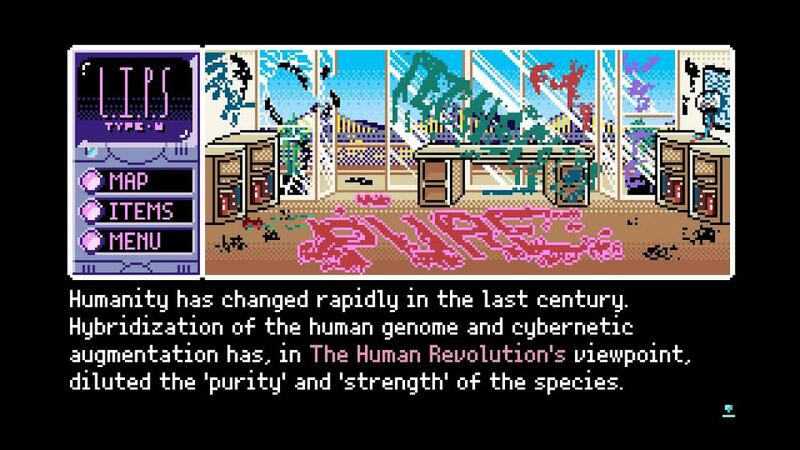 The meat of 2064: ROM is definitely in the realm of science fiction and will appeal to those who like their stories fact-heavy. Technical jargon cannot be avoided when talking about a future riddled with problematic cross-currents of AI versus preservation of the human species as we know it. The problem is that most of it is delivered as exposition. To break up the monotony of delivery, there are a few puzzles (often dealing with hacking) that bring welcome active player involvement. These puzzles are not difficult - that is not their purpose - and I think the developers got it right by not diverting attention away from the story to tricky brain exercises that would stall the flow. In the second half of the game, the pace picks up and the tension meter leading towards the climactic scene is well judged. If you ever wondered whether there is a difference between AI mimicking the human brain or the human mind … then this finale will certainly provide plenty of food for thought. A futuristic world is only ever as good as its world-building is convincing. I was honestly sometimes astounded at the amount of background world creation that has clearly been poured into this game. At one point, I found buried deep within Turing’s dialogue options of seemingly endless supplies of extraneous information a real gem: an utterly and frighteningly believable history of the political development of Los Angeles and the Bays Area from the year 2020 to 2064; a depressing story of corporate power hunger gobbling up teetering public services until whole towns and regions are owned by big companies, with precious few legal restrictions to keep them from exploiting their dominant position in every aspect of people’s everyday lives. I’m still digesting this, and keep thinking about it. This world-building is not quite as successfully carried over to the visual department. The choice of retro pixel art limits the detail that can be presented, and unfortunately I did not experience the artwork as anything beyond the competent level of retro pixel we’re so accustomed to these days.In particular the depiction of Neo-SF was somewhat disappointing for me. It just looked pretty ordinary, apart from some cool interactive billboards and ROMs roaming the streets. One detail I appreciated, however, were the facial animations; I thought they were rather cleverly done. Once you move to a main console as your platform, players will experience your game most likely on a lounge TV - and they tend to be quite large these days. Even with the game ‘window’ restricted to a wide rectangle covering only about half of the screen, the pixels were still far too large in my opinion. I even cross-checked the PC demo version on a 17” monitor, and it definitely looks better there, albeit still quite ‘zoomed in’ on the pixel front. I anticipate that the upcoming PlayStation Vita version is likely going to be the best-looking; the game’s style and visuals practically cry out for a handheld gaming experience. A vital part of world-building ambience is the soundtrack, and I have only good things to say here, as it perfectly and persuasively captures the feel of the city and its inhabitants. I wish I could say that my journey through Neo-SF 2064 had been engrossing and gripping from start to finish. I alternated between enjoyment and stretches of indifference. I am genuinely glad, though, that we have this addition to our growing Western library of visual novel hybrids (! ).